A pre-ride course checkout ride was completed on August 26. The cue sheet has been updated to make some minor corrections on road signage and to incorporate several cautionary warnings. The current version is Rev. E, Draft 3 dated 8/26/2018. ~8.0 Reinholds: There are two RR crossings as you enter Reinholds. The crossings are perpendicular, but very rough. Use caution. 14.6 A sewer replacement project had Hill Rd in Wernersville closed. There is a short detour marked. You can also walk your bike along the left side of the road and get around the construction. Given the state of the project you may encounter nothing but fresh pavement patches. 15.6 The RR crossing leaving Wernersville has been given a caution notice. Not only is the crossing quite rough, trains pass through at least hourly. This is one where you really should look both ways before crossing. 21.2 It bears repeating that the metal deck bridge just before the turn onto Pallisades can be tricky. Even when dry the grating grabs at bike tires. If it is wet, please walk. 29.8 As long as we've used this route there has been loose gravel in a downhill turn on Gin Mill Rd just before the intersection with Grove Rd. There have been crashes and near-crashes all along. The gravel is especially deep this year. A caution note has finally been added to the cue. 52.5 The descent from Hawk Mountain has been tarred and chipped. The good news is that it is one of the nicest T&C jobs I've seen. The bad news is that loose stones remain, especially in a few of the turns. ~56.0 The final mile or so of Pheasant Run leading to the turn onto Lake Front Dr has been freshly tarred and chipped. While it may clear somewhat by the brevet, much gravel is likely to remain. Use a LOT of caution making the turn onto Lake Front. 78.3 There is a Stop Sign intersection at the bottom of the long descent into Pine Grove. It has been noted on the cue sheet. You'll want to pay attention as there may be traffic entering that intersection from your left as you arrive. 79.9 After years of being a crappy road, Long Stretch Road has fresh asphalt. You can let it rip on the descent to Oak Grove Rd. 85.8 - 94.0 Sadly, Swatera State Park remains in rough shape and we're forced to rely on Suedberg Road and Rt 72 to get though the Gap. There is a generous shoulder in many places, but not all. Traffic is fast. Be careful when moving between the shoulder and the lane as there is a milled rumble strip in the fog line. 109.3 Use caution when making this turn. For reasons unknown, the right-of-way has been given to Prescott-Reistville Rd instead of remaining with Prescott. Cars approaching from the opposite direction on Reistville may swing wide and into your lane (first-hand knowledge) so you'll want take a wide line through this turn. The PA Randonneurs R12 Brevet Series continues in September with the Hawk Mountain 200k on September 8. Event details are on the website. and registration is open. New member Rich Lucchese is rapidly embracing randonneuring and will be the Organizer for the event. 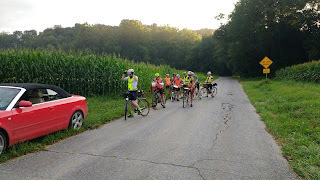 He even conducted an advance route check (one advantage of using routes that are approved as both brevets and permanents) so the event announcement could contain an updated and checked cue sheet. The start/finish venue has changed compared to past runnings of this route that some might remember. The start is now located at Martin's Country Market on the west side of Ephrata (similar to last February's Loop Around Lancaster brevet). We will finish at the nearby St. Boniface Brewery. This is much improved over the K-Mart parking lot we once used. I took the opportunity of a cue update to address a few other parts of the route. If you downloaded a cue sheet or copied the GPS track prior to August 23, 2018 you will have a difficult time completing the route. PennDOT has once again tossed a spanner in the works and decided to replace a bridge near the start. More significant, though is that the DCNR has closed significant portions of the Swatera State Park. The seemingly never-ending summer deluge has washed out portions of the Swatera Trail. A repair schedule remains uncertain, so we will revert to the original (and not as nice) descent along Rts. 443/72 through the Swatera Gap. Links for the latest cue sheet and GPS are available on the event page. Hawk Mountain remains a very scenic route, especially on clear days. If you liked it before, chances are you will still enjoy the adventure. It also remains a very challenging route. Most believe the rewards are well worth the effort. We will be starting just after sunrise so everyone will get to enjoy sunrise vistas in the early miles. Your safety is the number one priority on an Eastern PA event. While the risks outlined in the event waiver cannot be completely eliminated, the following will hopefully help keep you as safe as possible. - Summer weather often means heat and humidity. The route includes several stretches of unshaded roads that can get very warm in the afternoon sun. Be mindful of your fluid and electrolyte levels and it might also be a good idea to carry an ice sock with you if you need to cool down. - With the summer of non-stop rain you should be extra vigilant for debris that has washed onto the road and perhaps even washouts of the road surface. - One of the most dangerous things you will encounter on the road just might be another cyclist. Keep a safe following distance when riding with other cyclists you are not familiar with. Please avoid forming a large bunch at the start of the ride. - Please note that the bike inspection checklist includes redundant lighting for both the front and rear lights. The finish cutoff is roughly an hour after sunset. While many may finish in the daylight, you don't want to risk disqualification by showing up lightless at the finish due to a mechanical-induced delay. - Bringing along a cell phone is highly recommended. - Mechanical assistance is not provided. Please send me a link to your SPOT webpage. - In general, the route heads you into some desolate areas, with limited opportunities for food and water. - Plan on replenishing supplies at the controle stops. The controles are typically at a store or restaurant. - If you feel like abandoning the ride, it may be an indication that you are not eating and drinking enough. Take a break, eat something, and it's likely that your outlook will improve. Before you know it, you'll be making that last turn back to the finish. And remember the golden rule of "… eat before you're hungry and drink before you're thirsty." - If you are still riding past the ride time limit or if you intend to abandon the ride, please contact the organizer or the RBA. Phone numbers are provided on the cue sheet. - It is your responsibility to make arrangements for alternate transportation. - Please mention any safety hazard you might have spotted, or near-miss incident you saw. We value this feedback highly and it will help PA Randonneurs improve the next edition of the event. Registration remains open until 11:59pm on September 6. Register now! Preliminary results of the inaugural Midnight Express 200k have been posted on the PA Rando website. The results will be submitted to RUSA in a few days and become final pending ACP certification. All riders who clipped in to start finished the route and 20 of 22 finished within the time limit for a 91% finish rate. Well done to all. Finishers showing RUSA medals (and handlebar bags), photo by George M.
PA Randonneurs celebrated RUSA's 20th Anniversary with something different. Instead of the traditional early-morning start, riders clipped in and rolled out at 7PM to embark on a 200k adventure on a new route. Skies were overcast, but the rain held off and skies cleared somewhat allowing moonlight to guide the riders for a while. Riders first encountered volunteer Ivan Umble along the route at a Secret Controle. Just checking on you guys. Anyone who looked at the route map would understand the need for this check. It has been a while since we've had a secret control it just seemed to add more interest to the ride. In an effort to expose riders to a wide array of route controls, the brevet also featured an Open Controle and an Information Controle. Variety is the spice of life. Secret(?) Controle, photo by Greg K.
From it's inception, the Midnight Express route was conceived as one to be ridden at night. Roads that are heavily trafficked during the day become private pathways at night. Some of the roads experience bumper-to-bumper traffic during the day, even weekend days. During an late night recon trip as I was developing the route, I encountered exactly 3 cars over the course of 45 miles of riding which gave me hope that the concept would work. Based on rider comments afterward, the route was a success. Riders avoided typical August daytime heat. Not so lucky were the volunteers on the course checkout ride. The checkout ride was conducted during daylight hours two weeks earlier, starting in a cool rain, but finishing in sweltering heat and humidity as afternoon temperatures reached the mid-90s. 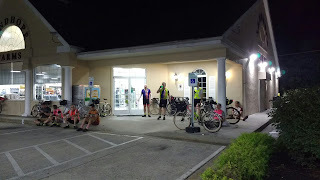 Temperatures for the brevet remained around 70 for the entire evening. Rain held off until the morning. It was definitely nicer for the brevet riders despite some early morning rain in the closing miles. The route was challenging as is typical for Southeastern Pennsylvania routes. Also as is often the case, an unknown talent shows up and aces the route. First-timer Jason Blome blazed around the route to become a randonneur and the first finisher. Jason is no novice; he owns a nearby bike shop and logs many miles every year. Night riding is one of his favorite types of riding and what piqued his interest with this event. Hopefully he will join us again. 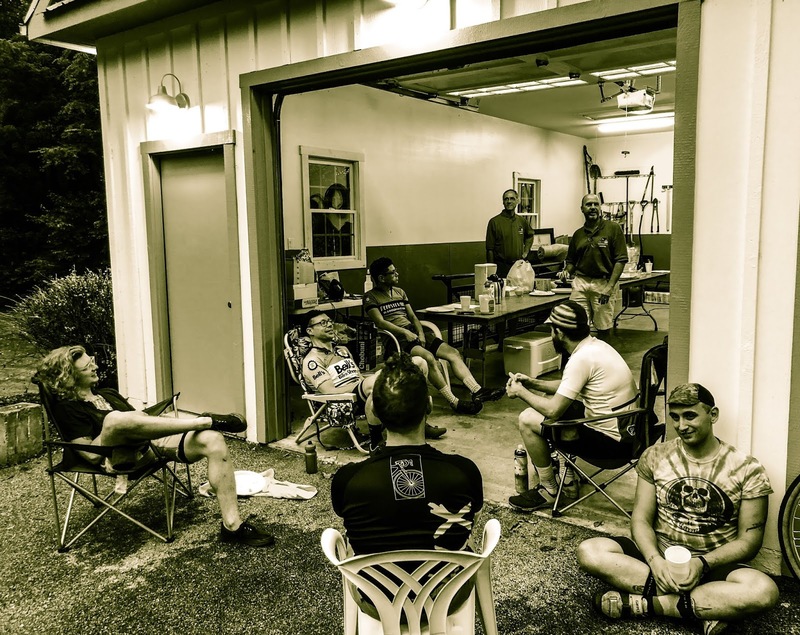 PA Randos at Port Deposit Controle, Photo by Greg K.
In addition to Jason, riders James Hultquist-Todd and Gary Wilpizeski became randonneurs, each finishing their first brevets in fine fashion. How many randonneurs can say that their first brevet was an overnight event? Congratulations to you all! 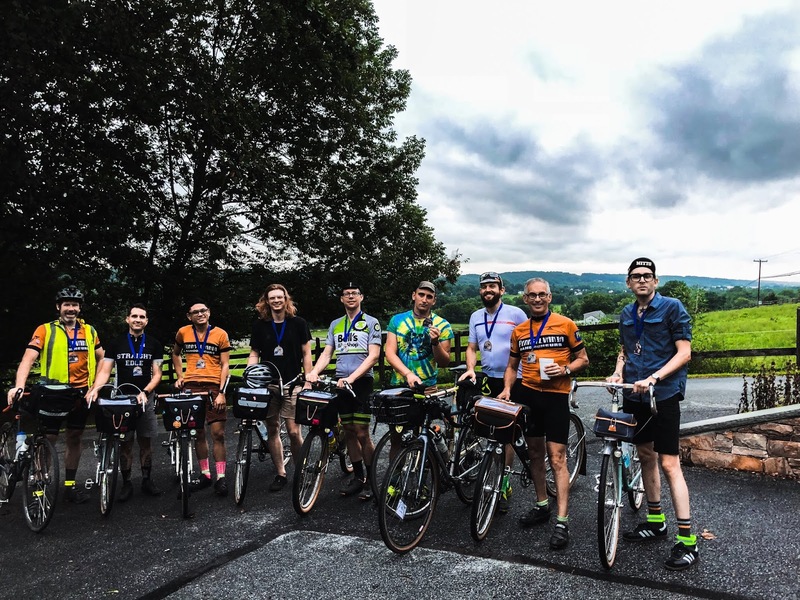 We saw a new entity at this brevet: The Philadelphia Dynamo Headlight Society. It seems that CJ Arayata has been promoting nighttime riding and secretly recruiting unsuspecting cyclists to join the ranks of randonneuring by hosting overnight adventures to various eateries around Philadelphia. In addition to CJ, Society members included Shawn Bowles, Luke Elrath, Alex Manta, Ryan Stanis, and Gary Wilpizeski. Could CJ be planning a two-team Fleche campaign for 2019 ? CJ sent an interesting link showing his progress around the course. Keith and Bill rolled in about 30 minutes after the time cut-off, wet, tired, but smiling. Post-ride relaxation. Photo by George M.
This event would not have happened without the encouragement and brainstorming contributions of George Metzler. He and I have cooked up a few interesting events over the years and this one was no exception. It started as a "what if" when RUSA announced the 20th Anniversary celebration and grew from there with our usual quest to do something totally different. Thanks George! George has posted his collection of photos on the web. Check them out. Thanks also to pre-ride volunteers Paul Currie, Rich Lucchese, Chris Nadovich, and Gilbert Torres. These guys all rode about 5 bonus miles without complaint as I re-routed on the fly during the course checkout ride. Gilbert stationed himself at the West Chester controle Saturday evening to offer a friendly face of encouragement as riders set off into the nighttime darkness. Had the cue error not been discovered, riders would have faced a difficult loop around in early morning darkness. As it was, only a few bonus miles were reported on the brevet. Even though he could not make the pre-ride, long-time PA Rando Mike Lutz arrived at the finish at 5am to help with breakfast. Next up is the Hawk Mountain 200 starting in Ephrata, PA on September 8. Details are posted on the PA Rando website. Registration is open.